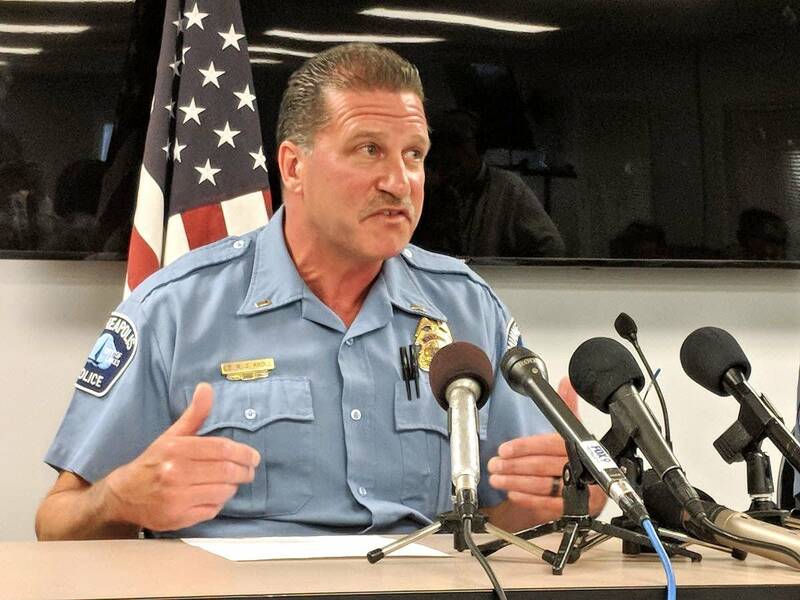 Updated 2:15 p.m. | Posted 10:23 a.m.
Police body cam video released Sunday shows Minneapolis officers had no choice but to shoot Thurman Blevins, Minneapolis police union president Bob Kroll said Monday, adding that the investigation will also show Blevins shot at police during the chase. "They were forced to fire at the suspect only after he pointed a gun and fired at the officers," Kroll told reporters Monday as he chastised those who questioned whether Blevins had a weapon or whether officers had to shoot. He urged prosecutors to pursue criminal charges against witnesses who said Blevins did not have a gun. "We challenge activists: Tell us what you would have done different or better. We are currently hiring" for the force, he said. Kroll said the video shows Blevins, 31, firing a round from his gun as he turns, with the bullet hitting the pavement near one officer. "This isn't make believe, folks. This is what happened. We saw it. When he comes around with that gun, at that point he's fair game." Investigators looking into the shooting have not said whether Blevins fired a gun during the chase. Hennepin County Mike Freeman announced later in the day that the officers would not be charged and that his review showed their use of deadly force was justified under the law. The prosecutor, however, said he was not certain that Blevins fired at the officers. "We can tell that the gun was fired three times," he said, but "I cannot tell you that there is sufficient proof that he, in fact, lined it up and shot at the officers." One of the officers thought he did and that's one of the reasons he returned fire, Freeman added. The officers remain on paid administrative leave. Freeman told reporters he'd decided late last week not to charge them and then thought it through again over the weekend. The video released Sunday by Minneapolis Mayor Jacob Frey shows officers Justin Schmidt and Ryan Kelly in their squad, driving and looking for a man in a tank top who was reported to be shooting a handgun in the air. They appear to spot a man matching the description. One officer says he sees a gun and both begin pursuing Blevins on foot, down the street and into a north Minneapolis alley. "Stop or I'll shoot," one officer yells as he pursues Blevins. Blevins at one point appears to respond, "Why?" When an officer yells at Blevins that he sees Blevins has a gun, Blevins appears to reply, "I don't." He continues to run as Schmidt orders him to drop his gun. An enhanced video released by the city appears to show a gun in Blevins' hand when officers open fire. After Blevins has been shot, the footage shows officers kick what appears to be a gun away from his body. About 40 seconds elapse between the time the officers report seeing a gun, and when the shots are fired. In the days following the shooting, authorities had said officers were responding to a report of a man firing a gun in the neighborhood near the 4700 block of Bryant Avenue North, and that Blevins had a gun when police encountered him. Blevins' family and other community members had disputed that account. Blevins' death has sparked protests, as it came in the wake of other high-profile police shootings in the Twin Cities in recent years, including the deaths of Jamar Clark, Philando Castile and Justine Ruszczyk. Blevins' cousin, Sydnee Brown, said the video shows the officers had options other than shooting. "I don't want the media and the world to think that we are angry. We're not angry. We're more so disgusted," Brown said of the decision not to charge the officers. "We're disgusted by the leaders of the world, we're disgusted by the leaders of Minneapolis and Minnesota, and at the end of the day, we want the cops arrested." Editor's note: Links to the videos are available on the city of Minneapolis website. The videos are extremely graphic.